Parenting is, simply put, harder than it used to be. Parents face an avalanche of unreasonable expectations, and are chronically plagued by the sense that they’re just not doing enough. Many parents who pursue counselling for their children find that they also need it themselves—both to manage the challenges of parenting a difficult child, and to cope with the myriad self-esteem issues that accompany contemporary parenting. It doesn’t have to be this hard. 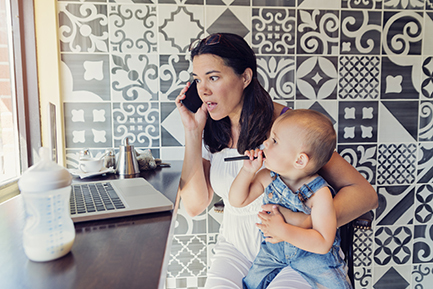 Here are five things you can do right now to make your job as a parent so much easier. Sure, everyone wants a perfect child. But dos your child really need to follow your every demand? Successful parenting is about choosing your battles. Think about what really matters and stick to your guns. Then leave the small power struggles alone. It doesn’t really matter if your child reads in bed, doesn’t play the instrument you want him to play, or wants to pain her room a colour you dislike. If you don’t choose your battles carefully, you will spend your entire life as a parent fighting with your child—and you will probably lose most fights. You don’t have to punish your child for every transgression. Most bad acts come with natural consequences, but you need to let your child experience these consequences. If she doesn’t eat her dinner, she’ll be hungry until the next meal. If he stays up too late, he’ll be exhausted at school. If he doesn’t study, he will incur his teacher’s wrath. Allowing your child to experience natural consequences makes your job easier, and it prepares your child for life in the real world. That’s a double win. It’s hard when your child isn’t exactly like you, or when you don’t understand something about your child. But trying to control things that don’t matter—your child’s political or religious beliefs, or his or her sexual orientation, for instance—is a recipe for failure and frustration. Don’t try to control things that are uncontrollable. Instead, focus on the basics—no drugs or alcohol, good grades, treating others with respect, and following family rules of decency. Parenting can feel like an endless stream of tasks: clean the kitchen, make dinner, help your child with homework. The list goes on and on, and few of these tasks are actually enjoyable. Time for a new set of priorities. Do only what absolutely needs to be done, and schedule more time for fun. Whether it’s a family movie night, a weekly hike, or just 30 minutes a night spent watching a favourite show together, you’ll enjoy parenting more—and cultivate a better relationship with your child—while getting a much-needed break from life’s most annoying tasks. You do not have to spend every waking moment with your child to be a good parent. Your relationships with yourself, your friends, and your spouse also matter. Set aside time for each. Schedule a weekly date night. Go to the spa. Take an evening away from your kids. Parenting is hard work, and you’ll be better equipped to tackle it head on when you’re rested and feel good about yourself. If things get serious you can always come to us for children counselling.